Delin Colón is a writer and freelance editor with a background in clinical psychology. She is the author of two non-fiction books about Rasputin's humanitarian efforts, and the first two children's books in her planned series on typical toddler issues. Colón lives in the Pacific Northwest U.S. with her husband, a fine art photographer, and their two mini-dachshunds. 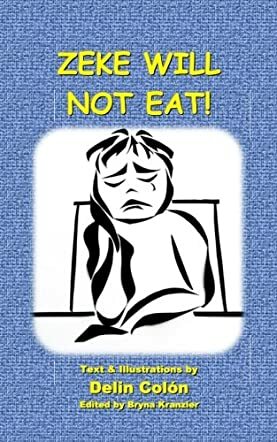 Zeke Will Not Eat by Delin Colon gives parents a new way to get their picky child to eat. Zeke is a very picky eater. One day Zeke’s father tells him how Zeke’s Grandma made it fun for him to eat. Zeke then learns that eating things can be fun if you look at food from a new perspective. Me being the mom to the world’s pickiest eater, I knew I had to read Zeke Will Not Eat. I was not disappointed. Colon gave me a couple new ideas to try with my daughter to get her to eat. My daughter liked the story mainly because it rhymed and flowed nicely. She liked the idea of eating car wheels. In fact, since reading it, she has eaten 'worms' that were spaghetti noodles. She did not care for the illustrations. She prefers colors. I thought the illustrations were pretty clever. I was happy to see that Colon included instructions on how to do the cut-paper art in the back of the book. I look forward to trying it with my daughter. I am also going to suggest the art idea to her teacher. The wording in the story is rather easy to read. My daughter had no problem reading it by herself. Colon did a great job on this book. I liked it! This is exactly the type of book I love to read with my daughter. Any book that teaches children to step outside of their fears is good. I recommend this book to anyone with a picky eater.